Always keep your lipo charged, and when it is low power or running weak stop using it to recharge. 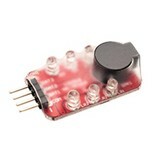 Can be used for 3.7V (1S Pack), 7.4V (2S pack), or 11.1V (3S pack). Red LED will flash when cell is below 3.3V and an Alarm will sound when cell is below 3.0V indicating the Lipo Battery pack should be recharged.